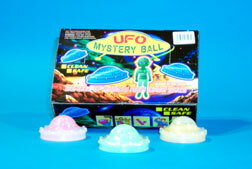 Assorted colors of playful putty that glows in the dark. Plastic egg is 2 inch. (24 pieces per box). $6.20 per dozen for 12 dozen or more. $5.55 per dozen for 36 dozen or more.